November is Lung Cancer Awareness Month, and for the cancer treatment specialists at OC CyberKnife, this is more than just a holiday – it’s a crucial way to raise awareness and help more people understand the signs, symptoms, and risk factors of lung cancer. As a world-class cancer treatment center serving the Orange County area, we treat patients battling lung cancer every day. The best way to fight lung cancer is through early detection and prevention – so here’s everything you need to know about preventing lung cancer and how to spot it when it does arise. Smoking: By far, this is the most common cause of lung cancer. Cigarette, cigar, and pipe smoking all create an almost identical risk for lung cancer. It doesn’t matter whether you’re smoking low-tar, light, menthol cigarettes, or any other kind of tobacco product: they all drastically increase your risk for developing lung cancer. Secondhand Smoke: Even if you aren’t the one smoking, tobacco smoke still increases your risk. Inhaling smoke from someone else’s cigarette – “secondhand smoke” – also increases your risk of lung cancer. Even thirdhand smoke, which is inhaled from smoke particles embedded in things like furniture, can increase your risk. Radon: Radon is a tasteless, odorless, colorless radioactive gas that forms from the breakdown of uranium found in soil and rocks. Some homes and buildings can have elevated radon levels, putting you at increased risk of lung cancer if you live in one of these areas. 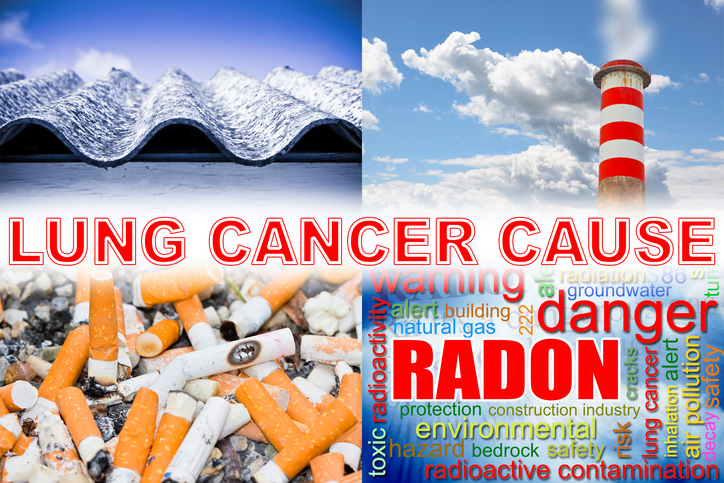 Radon is the second-leading cause of lung cancer in the US, and it’s a good idea to have your home tested for radon levels. One of the most difficult things about lung cancer is that during the early stages of the disease, it produces virtually no symptoms. Because of this, most cases of lung cancer aren’t diagnosed until an advanced stage when the cancer has already spread to lymph nodes or other parts of the body, making it very difficult to treat. That said, recent studies that certain preventive screenings like low-dose CT scans can help detect lung cancer early in people with a high risk, lowering the risk of death from lung cancer. If you have any of the risk factors for lung cancer, you should talk with your doctor about undergoing preventive screenings. While they may not be right for every patient, they present a viable option for early detection and more successful treatment. At Orange County CyberKnife, we help patients battle lung cancer through state-of-the-art treatments like CyberKnife on a daily basis. We’re proud to provide some of the best cancer treatments in the world, and if you or a loved one have recently been diagnosed with lung cancer, we may be able to help. Contact us today to schedule a consultation and see if CyberKnife may be right for you. And remember, no matter how the situation looks – there’s always hope.